Home > 12 volt LED Dome Lights > FriLight 8675 (no switch) Pinto LED Ceiling Spot Light, 12 volt-24 Volt (10-30vdc). Recess Mount. Choose soft Warm White 3 Way LED, bright Cool White LED, soft Warm White LED, Red, Blue, or Bi-Color LED. 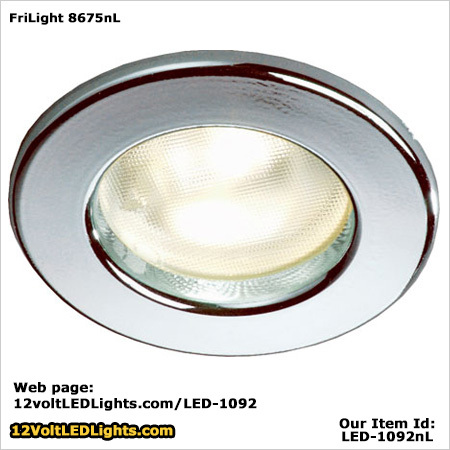 The FriLight 8675nL is a plastic ceiling spot light fixture with 1/4 inch deep recessed (inset) patterned glass lens. FriLight 9477 SUPER Nova LED Dome Light, 12 volt - 24 Volt (10-30vdc). Shallow Recess Mount. 270 Lumens Warm White. 6 bezel color choices.